When you want carrot cake but it’s way too early to eat cake and retain your dignity…Carrot Cake Pancakes to the rescue! These are moist and homey with hints of spice, just like their cakey inspiration. You can also add pecans or walnuts (1/2 cup or so), if that’s how you roll. I was just craving straight-up carroty goodness so I skipped them. In a small mixing bowl, using a fork, beat the flax seeds together with the milk for about a minute. Add the vinegar, water, maple syrup, oil and vanilla. Mix well. In a large bowl, sift together flour, baking powder, salt, and spices. Make a well in the center and add the wet ingredients. Mix with a wooden spoon just until combined. Fold in grated carrot. Let batter rest for at least 5 minutes. Preheat a large non-stick pan over medium heat. Lightly coat pan with cooking spray or oil. Add batter in scant 1/4 cup scoops. I use an ice cream scooper for this and it works magically. Cook three at a time for about 4 minutes (or until the tops look mostly cooked), then flip and cook until lightly browned, 2 more minutes. Keep on a plate covered with tin foil until ready to eat. Serve with pure maple syrup. Oh my god. These sound heavenly. I think tonight will be a Breakfast-For-Dinner sort of night. Wow – I have to get off this site right now – I am starving – everything here looks so great! YUM! And here I thought that every possible pancake variation had already been discovered. dignity be darned! it’s really NEVER too early for carrot cake, is it? 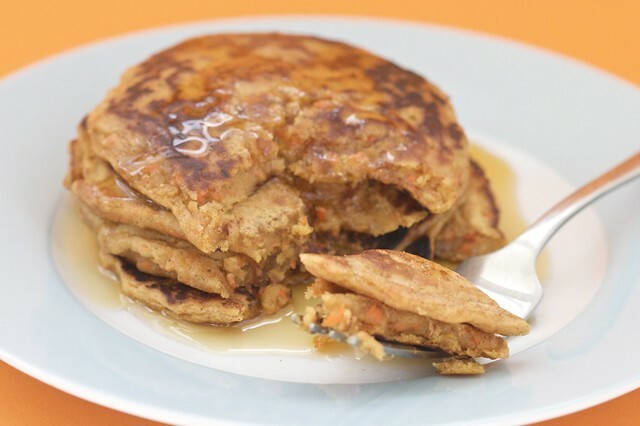 that, notwithstanding, i LOVE the idea of carrot cake pancakes! thank you! Will the carrot pulp left over from juicing work just as well? Holy wow! Those look SO amazing! Will my dignity be harmed if I slather this in cream cheeze frosting?? Would it still count as breakfast? making these for my boys tonight for dinner. Yum yum! I cannot wait to make these! Wait…why wait?? Pancakes for dinner. Yummy! ok yeah, i guess i know what i am having for dinner. who cares if i eat pancakes for dinner, these look too amazing to wait til tomorrow morning! Don’t be ridiculous, it’s never too early for cake! I so want this now! Can’t wait to make these. holy shiitake isa, you are a mad genius. I can’t wait to make these. amazeballs! Sooooo freakin’ awesome. I am hungry just looking at them. AMAZING! I am so down to make these! Any recs on turning this into a totally awesome waffle recipe? I’ve had this idea to try developing all kinds of carrot-cake inspired desserts (even before I had the fantastic carrot cake cookies from VCTYCJ), but I have to admit I hadn’t thought about pancakes. Also, I just realized I usually make the scones from VWAV adding carrot pulp from a juicer, but never thought about turning them into sweet carrot cake like scones (where I come from scones are always savoury). In Finland carrot pancakes are fairly popular, but always savoury, as well. Hmm. Lots of carrot inspiration! I so want these! And I think all the carrot helping with the body, they’ll be easier to make gf than some pancakes. MAPLE CREAM CHEEZE SAUCE !!!!!!!! “see note” means read the directions about grating not shredding. it’s what’s for breakfast tomorrow at the kids request!! This was a fantastic recipe; really enjoyed it! One thing to note, we had a pretty raw first batch because we were cooking them on high heat for a short period of time (like we do with regular pancakes), but these needed a bit longer, at a medium heat. Again, really yummy recipe! Made these this morning with carrot juicer pulp and a hangover. You can eliminate the vinegar, but add maybe 1/4 teaspoon extra baking powder. Vinegar is used in baking to help replace eggs as a binder.,when combined with baking powder. I personally would not replace the vinegar with more baking powder, but probably 2 teaspoons of potato starch and a bit of xanthan gum. Actually I used vinegar to help react with the leavener. There is plenty of binding simply with the flour. I think Xanthan gum is going too far for most people. Hi- do you provide nutritional data for any recipes? OH! so you mean baking SODA not baking POWDER! Thanks for the reminder! I meant to make carrot waffles today. I made these for my very first time making pancakes from scratch and they are SOOOOOOOO GOOD. The consistency and combination of spices are just perfect. Carrot cake should so be a standard pancake flavor! So amazing! We made these as a last-minute dinner idea since we were getting paperwork done. The recipe worked out to be perfectly easy and more importantly delicious! We couldn’t wait for breakfast the next day when we could have them again as leftovers! I think I’ll add a little more cinnamon next time but other than that, they are perfect! Thanks as always! These are great! Made them for breakfast this morning. I substituted honey (I’m not vegan) for half the maple syrup since I was running out of syrup and they turned out just fine. My one-year-old daughter loved them too! Could you make waffles out of this? They sound so yummy and I can’t wait to make these pancakes! These pancakes were fantastic, my 5 year old daughter even loved them! I added coconut to the recipe and it added just the right amount of sweetness. This recipe was just what I needed to whip up a supper in a grocery-barren pantry (payday isn’t til tomorrow!). YUM! Thank you! These were so delish! And with the maple syrup, they were sweet but not too sweet. Another great recipe that will be added to my collection. I made Isa’s “Pumpkin Pancakes” for my birthday breakfast a week ago, and for some reason they turned out awful 🙁 I’ve made her vegan pancake recipes a number of times, and the first time I made them (not pumkin, just plain) was the only time they were okay. Ever since they have NEVER cooked in the middle no matter how long I cook them:(:( HELP??? In fact, they turned out like nasty crepes- hard on the outside, runny on the inside. Is it possible that I over-beat the batter? Would that cause that? Hannah-Are you letting your batter rest? I took my last midterm early this morning, then made these after I woke up from my celebratory nap at 3pm…So worth it. Subbed in 3/4 c. whole wheat flour, and didn’t have any pure maple syrup (just el cheapo Aunt Jemima, thanks college!) so I put in about 1 T. of molasses and a very scant 1/4 c. white sugar, as well as about 1/2 c. walnuts. SO fluffy and cakey! So, mine were soggy in the middle, too. I let the batter rest, and I cooked on low heat for a long time to attempt giving them time to cook through without burning on the outside. I’ll try again – they look like they are definitely worth it! I didn’t see the note about squeezing out the water from the shredded carrots. Made a double batch following the recipe and a double batch altered to be gluten free (family of ten). Everyone loved them–thanks for sharing your genius!! These pancakes were so good, it was insane. LOVE. I made these “tropical style” by using coconut cream (CocoLoco) instead of maple syrup and I added pineapple. Really, really good. Delicious!! Mine came out soggy originally too… First, I tried cooking them for longer and spreading them out like suggested but they just burned. So, I added more flour and they plumped up and cooked all the way through!! Even my picky 7 year old LOVES these! These are fantastic! I’ve never been a huge fan of pancakes, always chose waffles or french toast first. THESE ARE AMAZING. How have I never had carrot cake pancakes before??? This is now my favorite brunch food! Thank you so much for the fabulous recipe!!! I know, I need to fix that. Instead just copy and paste the recipe. Delicious!! I was a little worried about making these after reading the soggy comments. I used a box grater to grate my carrots. The bits of carrot did not look as small as the ones in the photo, but they worked out just fine. I did not have any issue with sogginess. I did spread the batter around a little bit to thin out the pancake. They came out great! I was hoping for a little more carrot-y flavor. Mostly, I just tasted the spices. But, still, so delicious! We had them with maple syrup and bananas on top. I ate the leftovers cold. Very yummy! Also, I used 1/2 cup whole wheat pastry flour and 3/4 cup white flour. These are incredibly awesome. Came out exactly as the picture and are soooooooooooo good. Really nice cold as a snack too. Love them – thank you!!!! I just made these for my boyfriend and brother, and they were SO delicious!!! We added a little glaze/sauce made of melted EB, cream cheese and powdered sugar as a bonus, but they were great on their own. YUM! A keeper, for sure. My sister still brags to people about my cooking skills after I made these for her. I also made a vanilla and maple cashew “cheese” spread to layer between the pancakes. Heaven. I have been waiting all week for Saturday morning, because this is what’s for breakfast today. No review necessary. These are going to be phenomenal. Just found this – how many people do you think it serves? These were delicious! My kids ate 3 each….and I loved that they were full of carrots and flax. Not soggy at all. I might even say perfect. Delicious! Great way to get veggies into my son’s body! I added sesame seds and raisins for extra nutrients and used ww pastry flour- yum! Can I freeze them and reheat them aftewards? They were super moist . I layered the pancakes with spreadable cream cheese . 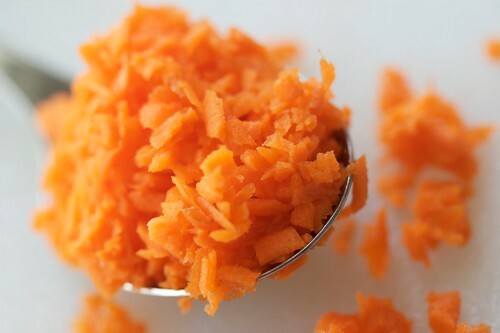 I juice a lot of carrots and this is the perfect recipe for the pulp! I love it! These are *so* delicious! They perked up a fuzzy day and were so tasty my husband is eating them for breakfast, lunch and dinner! nom nom! 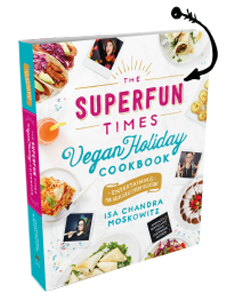 I made mine with almond butter and cranberries on top – but even just like that they are lush. These were amazing! My non-vegan boyfriend loved them, too! Can you do these gluten free with coconut flour? We love these at my house. So much that my niece wants these for her birthday breakfast. Can I prepare the recipe the night before and keep it in refrigerator? Or should I just get all the dry ingredients ready and the carrots grated the night before? I want to make these right away but I don’t have maple syrup on hand. Could I use brown sugar in place of maple syrup, if so do I use an equal part brown sugar to sub for it? THANKS A BUNCH ISA! Your awesome!!! Mine were soggy in the middle also. I think next time I will omit the water and use carrot pulp instead of shredded carrot. I bet they’d be perfection with that slight alteration. I’m wondering if some carrots are juicier than others.. Making the results vary… Still were delicious though with toasted pecans!! Please lееt me know iff this ok ѡith you. Thanks! Just made these. Can die happy now. Has anyone tried substituting ground chia seed for the ground flax in these? My husband can’t tolerate flax. At least that is what we think he’s been having a reaction to. Can you use egg replacer in place of the flax? My husband and I have been chowing down on these every weekend for a while now… I’m thrilled I found this recipe! He had been so resistant to eating vegan pancakes and actually asks for these! Thank you!!! It’s so much easier to not make multiple dishes to suit my vegan and his Omni diets. Made these exactly as the recipe calls and the insides are terrible doughy. Something is off with the calculations.